This week we wrapped up our study of China with a unit/lapbook on giant pandas from Homeschool Share, using the book Giant Pandas by Gail Gibbons. If you haven't checked out this great resource, hop on over and visit because there is a little something for most topics you might be studying. One of the most exciting parts of our week was having two of our monarchs emerge from their chrysalis'. 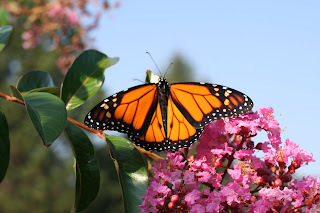 We had both a male and female butterfly, and let both of them go outside. Can you tell if this one is the male or the female? Our kids love the hands-on part of lapbooking (admittedly they don't always like to write a bunch of stuff), but love cutting/pasting and they DO love to show them off to everyone. 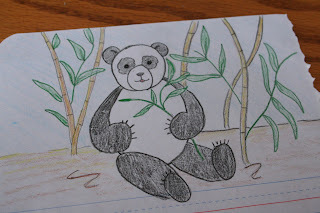 You can see their video explanation of their Panda lapbooks in our panda lapbook post. To go along with the Giant Panda unit the girls also learned how to draw pandas using Draw Write Now - and I cannot say enough about these books. I even had fun following along and drawing one too (not too shabby, I'm thinking! ).